When we work with an attribute table in gvSIG, we sometimes want to split the strings in one of the fields, in order to have a substring. For that, we would use the subString operator at the Field calculator, that will return a part of the original string. For example, if we have an only field with the code of a municipality (two numbers), then a space, and finally the name of the municipality, we would be able to be interested in having a new field with the code, and another one with the name. The subString operator will allow to do it. 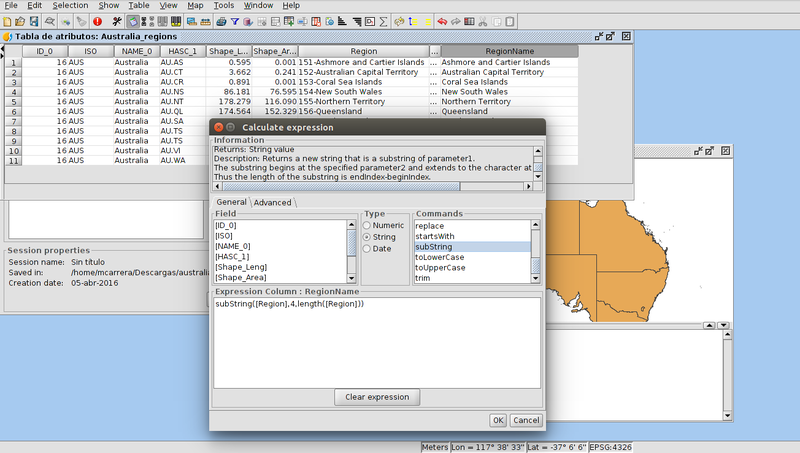 Parameter 1: It is the field name (between square brackets in gvSIG). Parameter 2: It is the position of the first character to be split. Parameter 3: It is the position of the last character of the substring to be split. And we have to take into account that the first position will be “0”. In addition, the Length operator can be used when we want to split the last characters and the length of the different strings in the field is different. We hope that this functionality is useful for you! This entry was posted in english, gvSIG Desktop, training. Bookmark the permalink.